Few parks anywhere can simultaneously showcase caves, a waterfall, a breathtaking overlook, the overgrown remnants of a former riverside town, a major lake, regional riverfront trails, and a historic industrial site. It's rarer still to find such an oasis within a 15-minute walk of a downtown that employs 50,000 people. Yet nestled along the lush bluffs of St. Paul's West Side and the city of Lilydale is Lilydale Park. Lilydale Regional Park traces its history to 1965. Historic river floods that year marked a profound change in the Mississippi River valley around St. Paul. The floods left a soggy legacy, marking the beginning of the end for the historic immigrant neighborhoods on the West Side Flats. In the intervening years, scores of modest homes and small businesses gave way to a floodwall, an industrial park, and more recently, dreams of a mixed-use riverfront redevelopment. Just upriver, the historic Lilydale town center met a parallel fate. But this time, instead of homes being replaced by a floodwall or industry, the neighborhoods of lower Lilydale were returned largely to a more natural state. The state Legislature designated historic Lilydale a Regional Park in 1971. Where Lilydale traces its roots to its place along the river, the city of Lilydale is now centered atop the bluff that overlooks its origins below. Lilydale Park occupies nearly half of the acreage in this community of just 800. For that reason, this tiny city elected to transfer ownership of its portion of the park and its management. Eventually, the park ended up in the hands of the St. Paul Parks Department, which already managed the portion of Lilydale Park within St. Paul's boundaries. By the 1980s, most traces of the park's former inhabitants had been removed. The city struggled to control illegal dumping, and on just one day in 1988 cleaned up a jaw-dropping 153,989 pounds of trash. Big plans were drafted for a renewed Harriet Island-Lilydale Regional Park. But while Harriet has seen major investments, its neighbor to the west has seen a new trail, a boat launch, but little other investment in its expansive 384 acres. At least, until recently. The park has found advocates in the Friends of Lilydale Park. Under the stewardship of longtime West Siders Jon Kerr and Grit Youngquist and numerous other volunteers, and with the support of the West Side Citizens Organization (WSCO), the Friends of Lilydale Park has been working to reconnect the blufftop West Side community with the park below. The group has worked to improve aeration in Pickerel Lake to reduce winter fish deaths, and control algae. 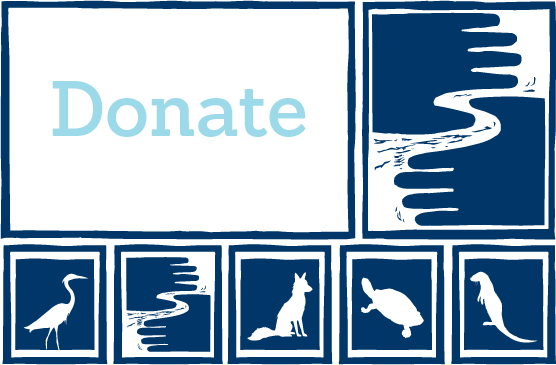 They successfully encouraged the city to sponsor an urban camping program at the park and supported school groups who frequent the park on fossil-hunting expeditions (now closed or greatly reduced). As then-St. Paul Parks and Recreation Director Bob Bierscheid noted in a 2004 Pioneer Press article, Friends of Lilydale is "emblematic of lots of groups in St. Paul that are critical to our work ... they are willing to put their time and energy where their mouths are." Trails have been constructed to connect the park's lowlands around Pickerel Lake with the blufftops and neighborhood above. The completed Brickyard Trail was dedicated in 2007. Along the winding climb to the blufftop, hikers encounter a cave, waterfall, areas full of fossils, and extraordinary views. The Friends of Lilydale Park partnered with the National Park Service to improve interpretation along the newly reconstructed Brickyard Trail. 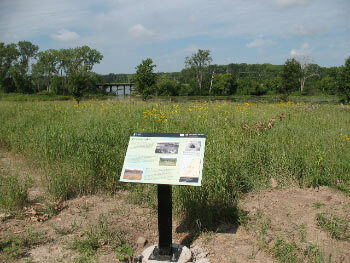 The panel below looks out over the eastern edge of Pickerel Lake in an area being restored to prairie. Many spots in Lilydale Park, like this one in the emerging prairie next to Pickerel Lake, feel as if they're hundreds of miles from the city. With growing successes under their belt, Friends of Lilydale worked with the St. Paul Department of Parks and Recreation to imagine a new future for the park. In 2010 and 2011, the St. Paul Department of Parks and Recreation has been developing a new Lilydale Park Master Plan to help guide and focus its redevelopment. Friends of Lilydale's Grit Youngquist co-chaired the task force that oversaw the planning process, along with FMR River Planner Bob Spaulding. The plans called for the creation of a new shelter and hub for the park on the banks of Pickerel Lake, and re-evaluated the course of Lilydale Road through the park, calling for pulling the road away from the edge of Pickerel Lake. The plans sought to open up access to the lake for canoes, and add a new boardwalk connection across the eastern end of the lake. The plans re-imagined the trail system through the area and included interpretive elements to celebrate the sites ecology and history. Dump areas were also to be cleaned up and some stretches of floodplain habitat restored. The Friends of the Mississippi River was excited to see renovations at the park and offered our comments and support. Advocates seem to agree that they want to improve the park without fundamentally changing the park's character. Where Como Park and Harriet Island Park will continue to be marquee event spaces, the goal was for Lilydale to continue to appeal as an urban refuge. To that end, Jon Kerr thinks the park's lush ecology and varied history will both be continuing pillars of its use and design. "One of the beauties of the park is that it is a crossroads between the natural and historic environment," Kerr said. "We think it's possible and appropriate to arrive at a sustainable balance between those assets." For questions about FMR's current role in Lilydale-related projects, contact River Corridor Director Irene Jones, ijones@fmr.org.